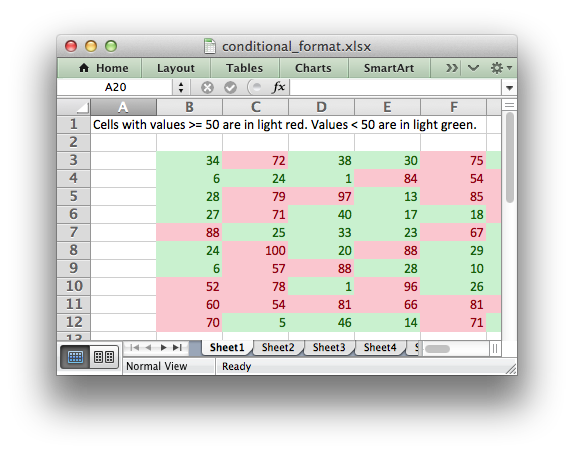 Example of how to add conditional formatting to an XlsxWriter file. Conditional formatting allows you to apply a format to a cell or a range of cells based on certain criteria. # Example of how to add conditional formatting to an XlsxWriter file. # range of cells based on certain criteria. # Add a format. Light red fill with dark red text. # Add a format. Green fill with dark green text. # Some sample data to run the conditional formatting against. # Write a conditional format over a range. # Write another conditional format over the same range.